Old Leake's Adam Abell and Swineshead's Callum Simmons challenge for the ball. Alex Snaith looks to hold off Scott Mackay. In an all-Boston League encounter, Swineshead safely made it through to the first round proper at the expense of Old Leake following a 3-1 away win. Old Leake competed well during the first half despite falling behind to Swineshead’s opener when a right wing cross was met by a low stooping header from Rhys Holland. The home side levelled the tie just before the break when Adam Abell’s effort was spilled out by the keeper and Patrick Kacirek snapped up the rebound. Old Leake had an early second half goal ruled out for offside and this setback seemed to rattle their composure and from that moment on Swineshead took control. Old Leake's Adam Tempest battles with Bert Snaith. Two fine Robbie Masters goals sealed the victory - his first being a majestic header and the second coming from a fiercely-struck shot into the bottom corner. Leverton will have to plan another visit to Beehive this Saturday after their preliminary round game was postponed due to a waterlogged pitch. In a Fishtoft Cup round one tie first division Freiston caused a minor upset when they ousted Premier outfit Billinghay Athletic from the competition following a 4-3 home win. Freiston’s Perrie Dale grabbed a brace while Troy Ayton and Tom Bates were also on target. Spilsby Town enjoyed a superb 7-2 home win against Wyberton Reserves, with Josh Wood striking two of his side’s goals. Town’s other matchwinners came from Eddie Rich, Liam Papworth, Dan Cobb, Lee Boulton and Adam Dales. Wyberton replied through Reece Beauchamp and Adam Vinters. Pointon suffered their second successive 5-2 defeat, this time at the hands of Skegness Town Reserves. Ian Jacquest and Ollie Cooper got on the score-sheet for Pointon but it was all to no avail as the visitors made their journey all worthwhile with Dan Reid netting his second successive hat-trick. Dan Field and Charlie Arabin hit the other Skegness goals. 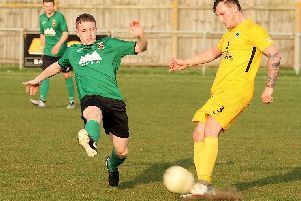 Benington battled back from two goals down to earn a share of the spoils in their home Premier Division clash with Ruskington. Goals either side of half-time had put Ruskington in control of the contest before a visiting defender headed a Gavin Bell corner into his own net to give Benington a lifeline. The hosts then got back on level terms from another corner as centre-half Jason Cade powered home a header. Both sides had chances to win the contest with Ben Newton going close for Benington, while Ruskington had a late strike ruled out for offside. Railway Athletic made the long journey to Fulbeck looking to extend their unbeaten run to three games, but in very wet conditions the surface proved difficult for both sides. A very cagey first half saw a few chances created at both ends but Fulbeck fired wide, whilst Railway found the opposing goalkeeper in good form. The second half started with some much better football from Railway and, after a great through ball, Curt Yeatman raced on to fire past the keeper to make it 1-0. With the game in its closing stages Fulbeck created three very good chances, all of which found Railway keeper Chris Moore in inspired form, saving all point blank efforts. The final strike was tipped onto the post for it to roll across the goal line then hit the other post before being finally cleared by Ben Chapman on the line to secure the clean sheet and the three points. There was another 1-0 away win at Friskney where Kirton Town returned home victorious. A Tom Ruck hat-trick helped Fishtoft to a 6-2 home win against Horncastle Town Reserves, while recent transfer capture from Benington Ben Hardstaff also got on the scoresheet. Neil Allen and Jamie Kuhn completed the scoring. Horncaste’s goals came from Lee Wilson and Andy Bullivant. The match was well controlled by referee Paul Revell. Old Doningtonians went one better, scoring seven goals in their away match at FC Kirton with Luke Barnett and Mark Sharman both netting hat-tricks. The other Dons goal came from Brandon Harker in a 7-1 victory. Kirton had competed well during the first half and had held their opponents to a 1-1 interval score, but then it all went wrong. Sibsey still hold a 100 per cent record following their fourth win on the bounce, this time a narrow 4-3 home win against Coningsby Reserves. Kayne Tate hit two of Sibsey’s goals while Jason Wade and Ryan Austin made sure of victory. Fishtoft Reserves travelled to Billinghay Reserves and both sides produced a very evenly-contested affair following their 1-1 draw. Fishtoft were behind in the first few minutes through a mix up in the defence. Neither side really got going in the first half and the only other chance in the half was a header from a Fishtoft player that went narrowly wide. In the second half Fishtoft came out rejuvenated and having made a substitution they looked as if they finally meant business. Despite having a hosts of chances, it wasn’t until the dying embers of the match that Fishtoft managed to conjure up an equaliser through Tom Luto, who pounced on the ball after the keeper had fumbled to give the visitors a valuable point. Two goals from Kristian Taylor helped FC Hammers to a comfortable 3-0 home win against Park United. The Hammers other goal came from Chris Brocklesby. Wrangle were held to a 2-2 draw at home by Pointon Reserves. Jack Hill and Adam Coulam grabbed the Wrangle goals. Swineshead A gained their first points of the season following a 2-1 home win against East Coast thanks to goals from Giles Favell and Jaydan Hunt. The match between Boston International and Fishtoft Reserves was postponed after the heavy rain made the playing surface unplayable. Boston Athletic have now scored 19 goals in their first three games following a 6-3 away win at Old Doningtonians Reserves. Tom Owens (teo), Damian Pugh, Andy Brown, Bailey Noe and Drew McGuire were all on target for The Boston side while Ben Pell’s double and an own goal replied for The Dons. Athletic managed to hold onto their three points despite being reduced to nine men following the dismissal of two players. Spalding Harriers seem to be clicking into gear after a thumping 7-0 away win at Boston College Reserves. Rafal Marczewski hit a hat-trick while Dilp Tamang and Patryk Kopacz both scored twice. Boston Titans enjoyed a comfortable 4-1 home win against Fosdyke Reserves with goals from Matt Howden, Mike McPhail, Ben Charlton and Chris Lane. Dave Clarey replied for Fosdyke. Goals from Jack Reeson, Michael Reeson and James Stubbs secured a 3-2 home win for Wyberton A against Northgate Olympic.